To Indians ‘Pickle’ is not just a word, it is a sacred word that injects the feeling of happiness and joy! Imagine yourself wrapped in a warm blanket on a cold night, your feet tucked under the blanket while you sip a cup of hot chocolate made by someone you love. You feel warm, relaxed, happy and content… To me when a jar of homemade pickle gifted by my loved ones invokes the same feeling! My country India is diverse country and that diversity doesn’t confine to regions, languages and people. 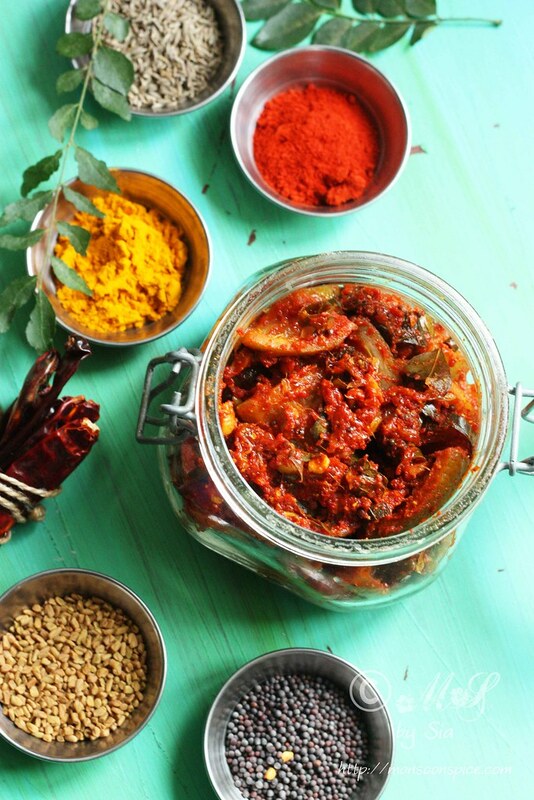 Indian cuisine is as diverse and colourful as the country and the people living there and the varieties of pickle that we make and consume will blow your mind if you are just used the idea of few vegetables immersed in a jar or vinegar! Hundreds of these extraordinary varieties of pickles are the pride of our country and we can’t imagine ending our meals without a smidgen of tongue tickling pickles adorning our plates. 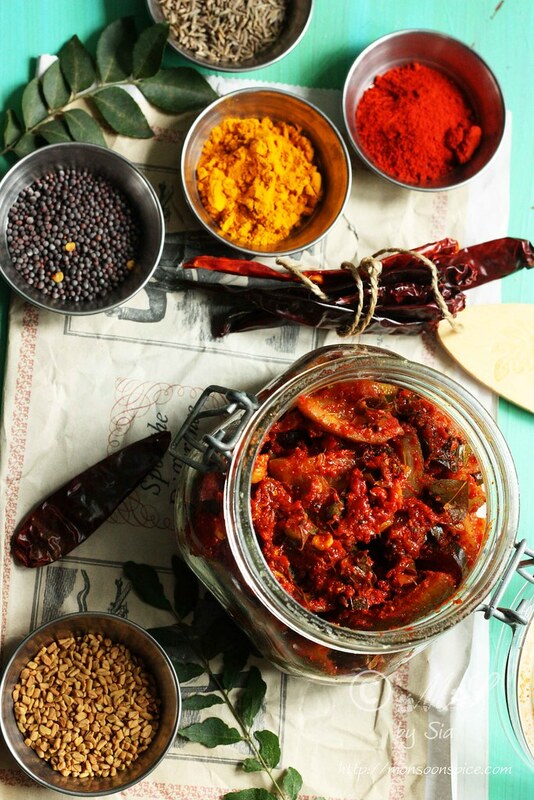 Whichever part of the India we might come from, pickle is mostly likely to be part of our earliest food memories that has ingrained into our culture, life and memories. Pickling techniques and the finished products vary from one region to another and even differ from one house to another, but the joy it brings and the bond it creates is same all around the country! 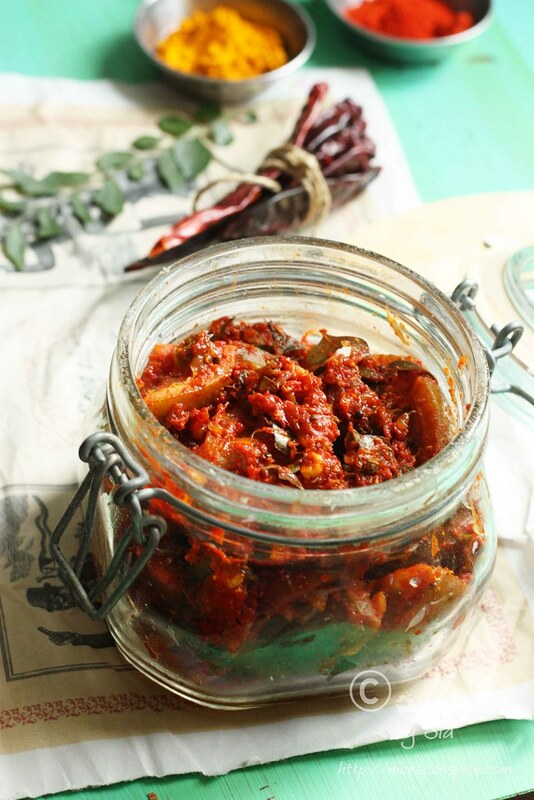 Pickle is a quintessential part of any Indian meal, which sometimes becomes an incentives to make every day home meals, sometimes which can become quite boring. 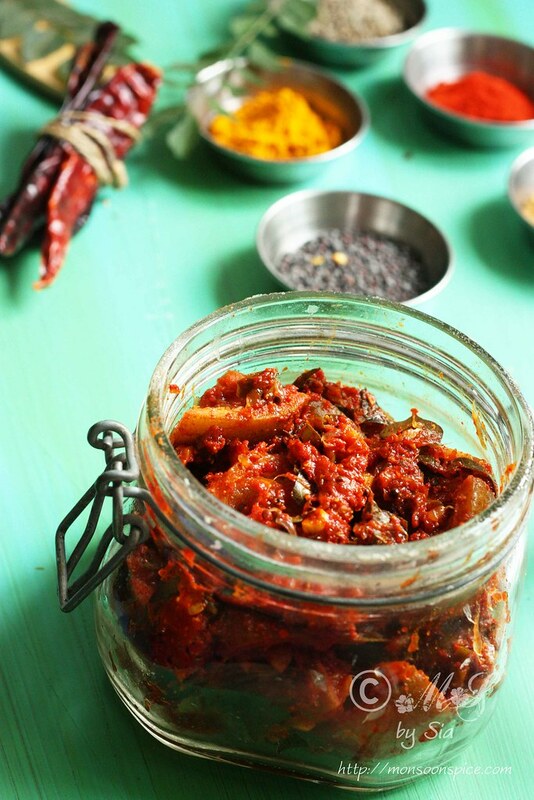 Red hot spicy pickle makes a piquant counterpoint to the staid combination of dal and rice or cold yogurt rice. Little piece of pickle can make even the most boring food taste extraordinary. That is the power of any good Pickle! Although readymade pickles are flooding the Indian and global markets, the magic of pickling making still continues to be strong in many households in India. The annual ritual of painstaking process of pickle making is still considered sacred and is given much respect it rightly deserves. Spicy, sour, sweet, astringent or salty, pickle is one thing that has the power to awaken my taste buds and memories of hot summer days spent in the company of my grandmother, mother, and loving aunts in the palatial home kitchen who lovingly filled dozens of large ceramic jars with pickles of different kinds. To me there is nothing that screams ‘I care for you’ than receiving a jar of homemade pickle made with care, love and dedication! 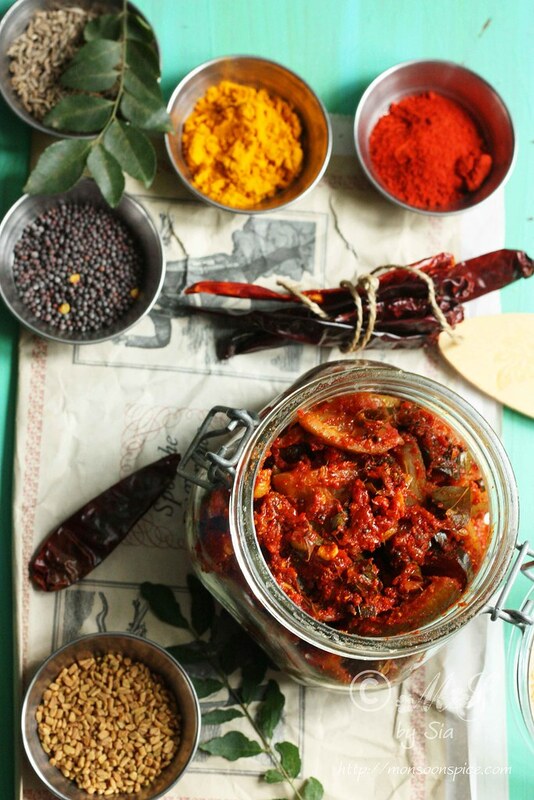 When I first tasted a Spicy Lemon Pickle or Nimbu Ka Achaar made by my good friend Vidya few months ago, I almost fell on her feet begging her to share the recipe. Well, not really! She is such a considerate and sweet person that she gave us a jar of Pickle as well as the recipe which she learnt from her mother. 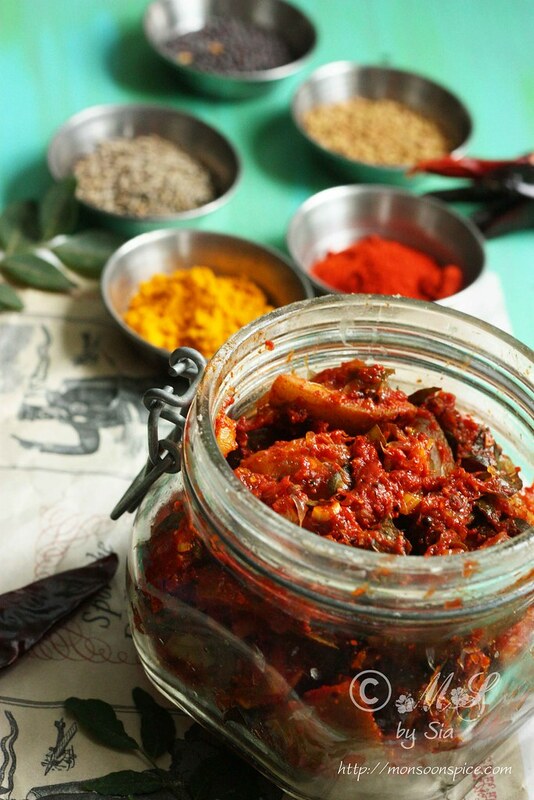 The recipe for this Nimbu Ka Achaar or Spicy Lemon Pickle is nothing like what my mother makes. The first step involves curing the wedges of lime or lemon pieces with copious amount of salt for few weeks before adding spices. The most interesting part of this recipe is the cured lemon pieces are cooked with the spices before finally storing in a sterilised jar. The curious ingredient other than the usual pickling spices is something I have unheard of, few garlic pods! Yes, garlic pods are used in making this pickle and surprisingly the combination of lemon/lime and garlic works very well in this Nimbu Achaar! Wash and pat dry the lime/lemons. Make sure that there is no moisture left. 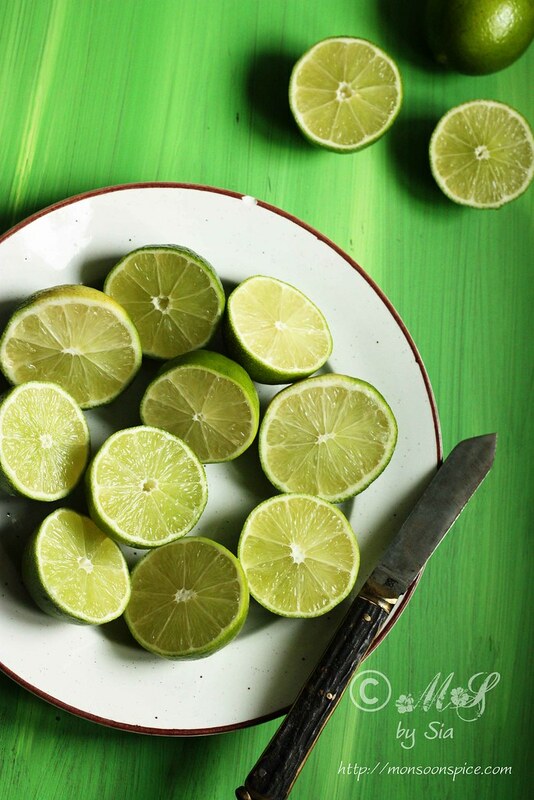 With the help of a clean and dry knife, cut the limes into halves and cut each halves into 4-6 equal pieces. 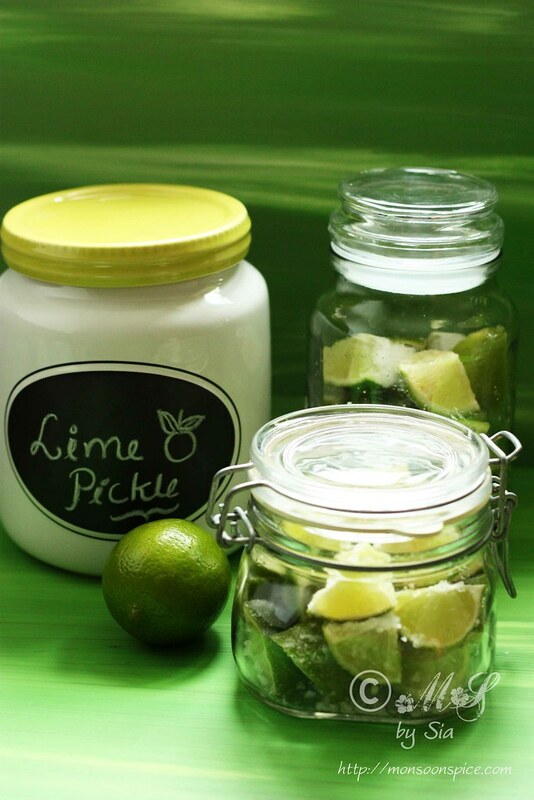 Start to layer the lime and salt in a clean and dry sterilised jar, preferably ceramic or glass jar with a tight lid. First place few lime pieces in a single layer and spread 1-1½ tbsp of salt on top. 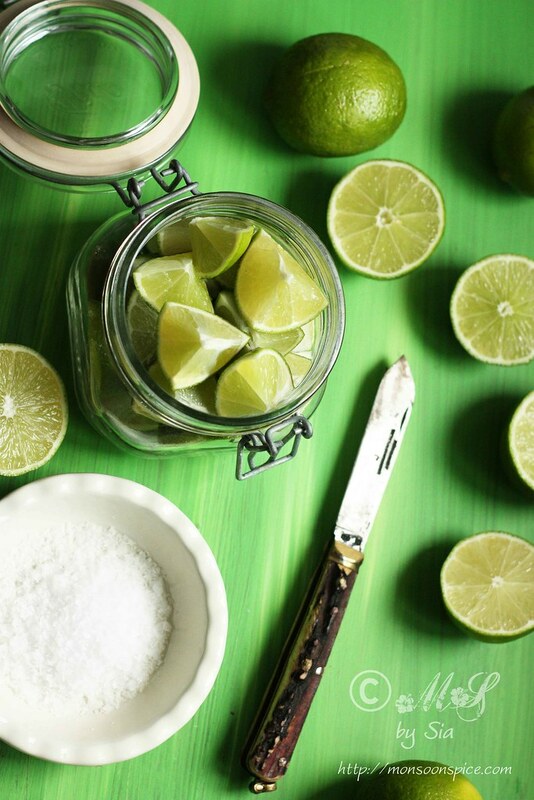 Continue to layer lime pieces and top them with salt until you exhaust all the limes. Close the jar and leave it in a window sill where there is plenty of sunlight steaming for 2-3 weeks. Make sure that you shake the jar once in a day to move the pieces around in the container without opening the lid. This will help in spreading the salt evenly and softening the lime. 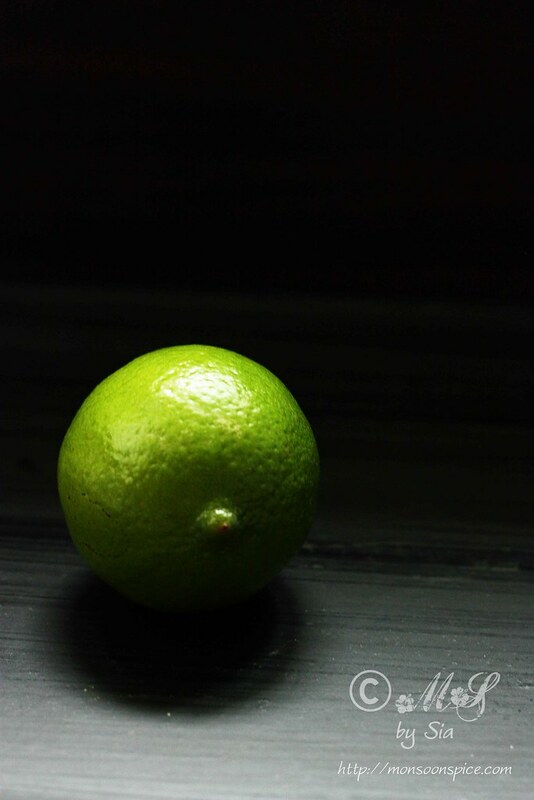 After 2-3 weeks, the limes/lemon pieces would have softened and changed their skin colour like the picture shown above. This is when you are ready to proceed with next step of pickling. Lightly roast the fenugreek seeds until their colour deepens to light red. 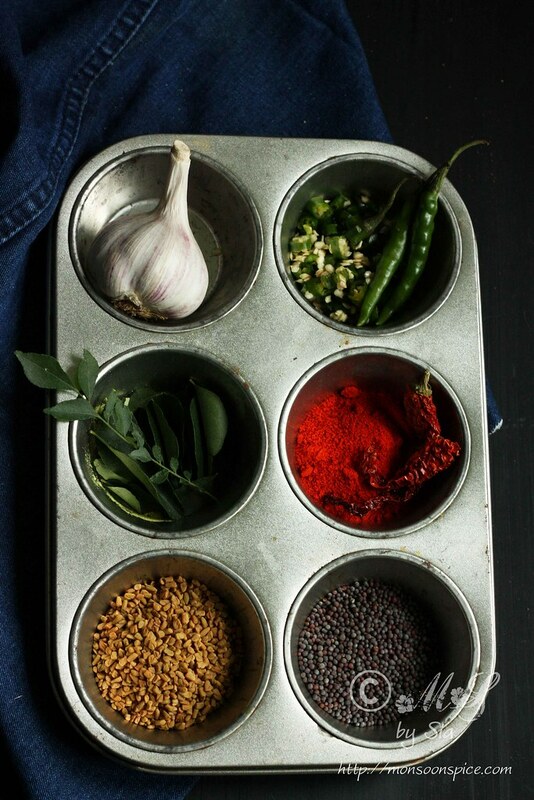 Let them cool completely before grinding them to fine powder with a help of a pestle and mortar or in a spice grinder. Keep it aside until needed. Heat oil in a pan and add cumin seeds and mustard seeds. When mustard seeds start to pop and splutter, add finely chopped garlic and fry them until they start to brown on the edges. Mix in finely chopped green chillies and curry leaves and sauté for few seconds. Next add cured lemon pieces along with the juice and stir them for 2-3 minutes on medium heat. Mix in red chilli powder, fenugreek powder and turmeric powder and stir them well so that each lime piece is coated well with the spices. Add powdered hing and mix them well before switching off the gas. 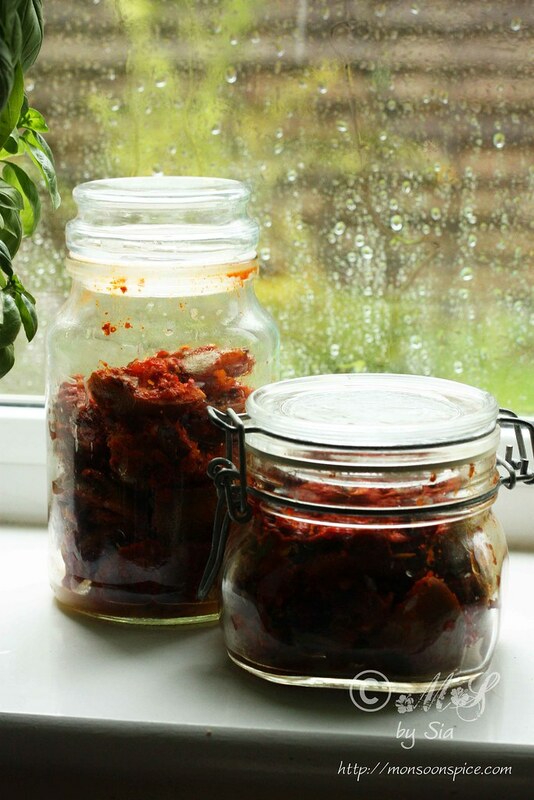 Let the Spicy Lemon Pickle or Nimbu Ka Achaar cool down to room temperature before storing it in a clean and dry airtight sterilised jar. It can be stored for 3-4 months in room temperature and upto 6-8 months in refrigerator if made with utmost care and stored in a right condition. 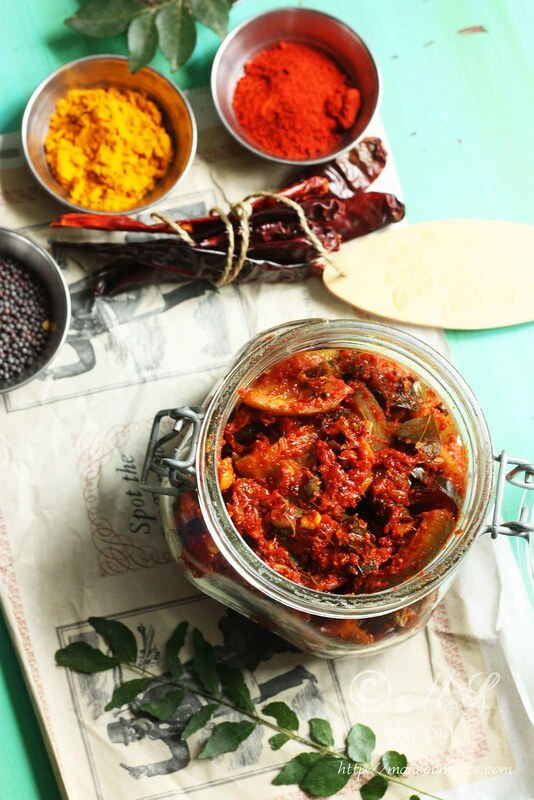 You can serve this delicious tongue tickling Nimbu Achaar or Spicy Indian Lemon Pickle with dal and rice, yogurt rice, dosa or any Indian flat breads and enjoy! Please make sure all the utensils, spoons and ladles, knife and cutting board and storage jars are dry and moisture free as any moisture content will reduce the life of pickle. Make sure that you don’t place the lid when you are cooking the cured lemon pieces. You can use the pieces of lime or lemon after you have used up their juice for this Spicy Lemon Pickle recipe. Just store them in a sterilised glass jar and top them with about 1-1½ tbsp salt per limes/lemons. If you can get hold of small Indian lemons which are yellow in colour and have thin skins, then you really are in for treat as they are the best one to use for this Spicy Lemon Pickle. Since we don’t get the Indian lemons here, I have used the green limes with comparatively thin skins. If the limes or lemons have thick skins then you will need to double the time to (at least 4 weeks) to cure the lemons before cooking them with spices. Nice colourful and tangy achaar. Love it with curd rice. What is the unit of measurement on the Fenugreek, I assume it is not just 1-2 actual seeds. @Lalania Garner-Winter, thanks for pointing out. It is teaspoon. I have made the correction in the ingredient list. Hi, when making this I used large rock salt without crushing it up first, so now 3 weeks later I have large chunks of salt still in the mixture, and quite a lot of juice as well. Is there any way to rescue this, or is it a lost cause? Hello Tom, just give a stir with a clean and dry spoon and let the pickle jar rest in a window sill where there is pleanty of sunlight for a day or two. The excess water in a pickle shouldn't be a problem as the juice will thicken over the period. Hope this helps! @Unknown, thank you for bringing into my notice. Cumin seeds are used in tempering. I have updated the recipe. Mark, if the limes have turned soft and can be easily crushed when pressed between your fingers then you can proceed with the pickling. If not, just add about 1/2 cup of freshly squeezed lime juice and let it rest for a day or two before proceeding with the recipe. Hope this helps. Good luck and let me know how it turns. Great recipe! My limes have been sitting on the window sill for about a week. But I don't think i added enough salt in the beginning, is it possible to just open the jar, add a bit more salt? I don't see any problem with adding a salt in between the curing process. Make sure that you use a dry spoon without any moisture in it. Quickly give it a stir and close the lid and let it sit for rest of the period mentioned in the recipe. I made a pressure cooker full - 10 jars! We jokingly called it Toxic Waste Lime Pickle & was a bit too hot for some wimps but others have rejoysed & cheered over it. I'm going to start my second giant batch soon.. Just one question though! Last time it took TWO months to rid my flat of the smell.. Any advice? I'm actually thinking of doing it on a barbeque outside next time!! I used your basic recipe to make pickle from the lime I used to make lemon concentrate. So basically I used only the skin of the lime and so I added vinegar to make up for the lack of sourness brought about by the juice. Also I skipped green chilly and curry leaves instead steeped up on the chilly powder. Sunned it only for two day instead increased the heating time. End result: awesome. Planning to do this every time I make lemon concentrate. Thank you & God bless. Have a great day. Please share: how do you maker lemon concentrate? I was so pleased to find this beautiful loooking recipe, I love your photographs. I have had my lemons in the salty solution on the window sill for over 2 weeks. This morning I mixed up the spices and followed your directions. I only used 1 1/2 cups of salt in the beginning, and more lemons than you suggested and the pickle is still EXTREMELY salty. I am going to bottle it up and see if anybody in my family enjoys it, but I suspect it will be just too salty. This seems a great disappointment after all of this waiting an using so many beautiful spices etc. I have previously made a similar pickle under the direction of my friends's mum who is Pakistani. (I am Anglo-Australian if that is helpful to put things in context, but my family and I LOVE Indian food and LOVE a lot of spice). 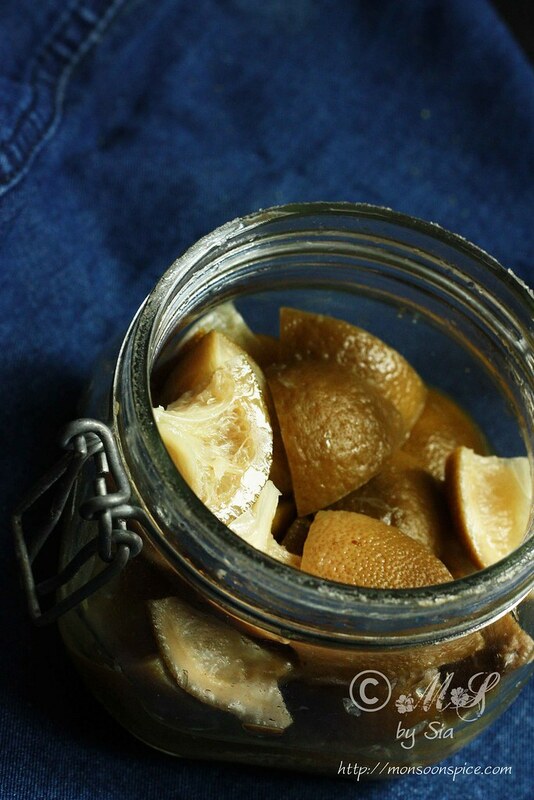 The difference was that she discarded the liquid (after a period of resting on the window sill), dried the lemons out on paper towel for a day and added more spices and topped the jar up with oil. I suspect an oily pickle may appeal to me more than an overly salty pickle. I am wondering if I have somehow misunderstood your instructions, because having as much as 2 cups of salt retained in a pickle of this size seems just too much. Please help if you have any suggestions. Thank you! I use 1 and 1/2 cups of salt every time I make this pickle as if I use any less the shelf life reduces. Sorry to hear that the recipe didn't work for you. Since you find the pickle too salty, I suggest you the following. 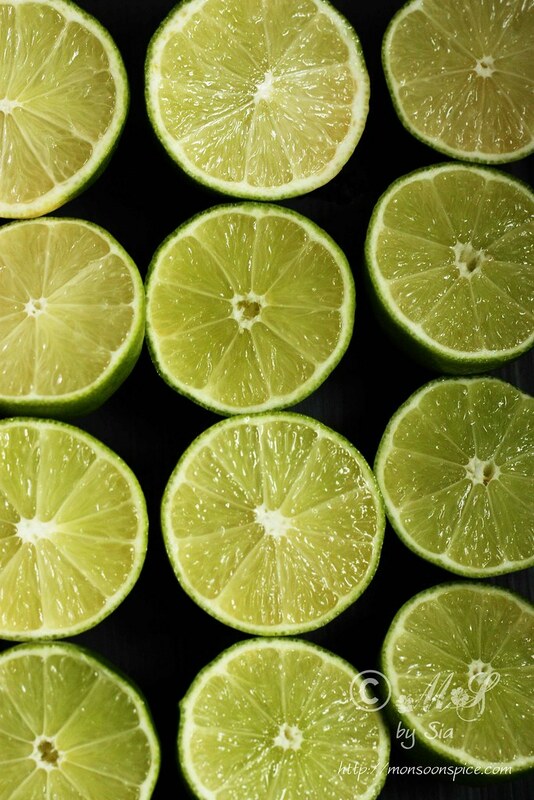 cut 4-5 limes and add about 1/4 cup of lime juice + 1 tbsp of salt. Let the jar sit in the direct sunlight at least for a week. Mix this with the prepared pickle. I suggest you to store the pickle in refrigerator. Hope this helps. hey...thanks for the recipe! i put the lemons and salt for curing about a week ago... there is a lot of lemon juice at the bottom of the container. Will it dry up by itself? The extra juice should not cause any problem. In fact, it will help to extend the shelf life of the pickle. You can add about half to one cup of freshly squeezed lime juice (depending on the quantity of pickle) and mix them well with a clean and dry spoon. This should help in dissolving the salt. Hi I really enjoyed the process of curing the lemons then preparing the pickle with the wonderful spices but the rock salt has still not dissolved. I found this out when eating my lovely Sri Lankan chicken curry and crunched in rock salt. It is too late to dissolve the rock salt and will I just have to discard this batch, any suggestions. Hi there. Great recipe and quite similar to a Naga pickle I am making, minus the lemons. A few questions for you here. Would be super happy if you could answer them? It tastes great if you get a not-so-salty bit. Is it possible to do it using less salt in exchange for something else? Also can I grind the rock salt down into a finer powder? Secondly, I have a fermented naga mash that I have made in a 4% brine. If I wanted to use it in place of chilli powder and fresh green chillies at what point would you suggest adding, and how long would I need to cook the mash for it to be safe? Sorry to hear that the recipe didn't work for you. Since you find the pickle too salty, I suggest you add about 1/2 cup of freshly squeezed lime juice to the pickle and mix it well with a dry spoon. This should help in dissolving the salt. If the pickle is way too salty for your liking, cut around 4-5 limes and add about 1/4 cup of lime juice. Keep the jar in direct sunlight for couple of days until the skin changes colour. Add this to the prepared pickle and mix well with the dry and clean spoon. And yes, you can grind the sea salt or simply replace it with a table salt. I hope I have managed to answer all your questions. Do come back and feel free to ask if you have any other queries. Always happy to help my readers with any doubts :) Have a lovely day. Hi again Sia. I was just wondering, do you think it would be ok to freeze some Indian limes before doing this? I have just finally managed to get some more - they're beautiful ping pong ball sized, sweet yellow limes. But I'm now away for over two weeks so I'm worried they'll go off and I don't have anyone to shake them every day! Hi Rod, freezing pickle is never a good idea as the moisture reduces its shelf life. If you have already pickled them, just keep it out at room temperature. If you have fresh lemons, keep them in refrigerator and they will stay fresh until you return. Make sure you wipe any excess moisture before using them. Hope it helps. Is red chilli powder the same as cayenne pepper? There is also something called chili powder which is used in Latin-American cooking and/or American BBQ rubs, a spice blend with oregano, paprika, garlic powder and cumin. Thanks. Hello Joe, it's cayenne pepper..
Can somebody please tell me the procedure to remove bitterness?? Hey Sia, I made this pickle today ( i mean since the past 2 weeks lol). My curious husband was like why is there a jar of cut lemons by the front porch ?:D. I just finished up the tempering . Smells and tastes amazing. I eliminated the garlic though (never had garlic with lemon pickle before) but added a tbsp of Gud(jaggery) to balance out the tanginess. Cant wait to mix it up with hot ric and ghee..YUmm. your pictures are awesome!! my mouth was drooling by the end of reading the recipe itself.Thank you for the Good recipe! !